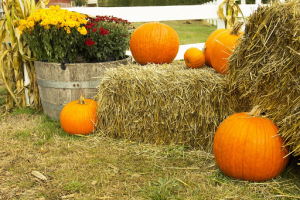 Use these tips to prepare your yard for the fall season! Fall is an exciting time of the year. Halloween is next month, and before we know it, people will be feasting on turkey at Thanksgiving dinner. If you want to transform your yard into a beautifully crafted fall landscape, it is crucial you consider a few important steps to help get you there. With that said, here are a few things you can do to prepare your yard for the fall season. There is no reason why you need to wait until October to decorate your property for the fall season. September is a month to start pulling out decorations from the basements and garage and dispersing them throughout your landscape. A landscape that features fall colors such as reds, oranges, and yellows will provide your landscape with a charming and festive appearance. Be sure to gather plant seeds before birds get to them! Use scissors to cut off seed heads and allow them to dry out on paper. Many gardeners like to store them in jars or paper envelopes. It is nice to have these seeds on hand when the spring season is back. Most homeowners mow their lawns on a regular basis during the summertime. Now is the time you can lay off the lawnmower and allow your grass to grow out a bit. This will provide your grass with some relief and allow it to regenerate. Also, this will give it the time it needs to adjust for the drier and cooler weather that fall usually brings. Most people loathe weeding their lawn and garden; however, it is a necessary chore. Weeds are blemishes to your property and take away from your home’s curb appeal. Not only does weeding make your landscape look better but it also keeps it healthy. By keeping your yard and garden healthy it will be ready for planting when spring rolls around. Don’t underestimate the power of mulch! Mulch helps to keep the ground warm by insulating the soil. You want to plant roots to remain warm when we are faced with colder areas. Mulching also helps to fill sparse areas in gardens. This entry was posted on Saturday, September 15th, 2018 at 9:59 am. Both comments and pings are currently closed.